In the past I have written about the need to restore reverence and a sense of the sacred to the Mass. The very fact that anthropocentric liturgies have dominated the ecclesial landscape for decades is the best indicator that few truly understand what is happening in the Mass. We cannot recover what we do not know. To this end I would like to highlight seven amazing facts about the Holy Sacrifice. Understanding these truths, and recollecting them while at Mass, will help enable the faithful to more fully participate within the Liturgy. Everything below comes from Lesson 27 of the 1949 revised edition of the Baltimore Catechism #3. May this current generation humbly learn from the wisdom of the past so that we may effectively catechize and evangelize the next generation. 1. 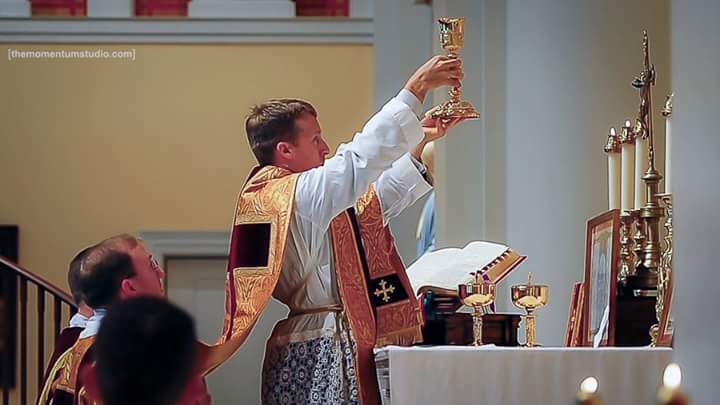 The Mass is the Sacrifice of the New Law in which Christ, through the ministry of the priest, offers Himself to God in an unbloody manner under the appearances of bread and wine. A sacrifice is the offering of a victim by a priest to God alone, and the destruction of it in some way to acknowledge that He is the Creator of all things. 2. The principal priest in every Mass is Jesus Christ, who offers to His heavenly Father, through the ministry of His ordained priest, His Body and Blood which were sacrificed on the cross. 3. The Mass is the same sacrifice as the Sacrifice of the Cross because in the Mass the victim is the same, and the principal priest is the same, Jesus Christ. 5. The manner in which the Sacrifice of the Mass is offered is different than Calvary. On the cross Christ physically shed His blood and was physically slain, while in the Mass there is no physical shedding of blood nor physical death, because Christ can die no more; on the cross Christ gained merit and satisfied for us, while in the Mass He applies to us the merits and satisfaction of His death on the cross. 6. At Mass we should assist with reverence, attention, and devotion. The best method of assisting at Mass is to unite with the priest in offering the Holy Sacrifice, and to receive Holy Communion. 7. The first Mass was said by our divine Saviour at the Last Supper the night before He died. Posted on February 8, 2016, in liturgy and tagged Baltimore Catechism, facts about the Mass, holy mass, sacrifice of the mass. Bookmark the permalink. 5 Comments. The FIRST source of the anthropocentric liturgy problem is found in the General Instruction of the Roman Missal [Paul VI version aka “Novus Ordo” Missal], No. 86 “…the priest greets all present, using one of the formularies indicated. He or some other qualified minister may give the faithful a very brief introduction to the Mass of the day.” When Mass begins with the priest’s improvisatory blathering—directed towards the congregation—it sets the stage for the rest of the Mass to continue in a similar, improvisatory manner. Simply fix these two massive defects in the 1969 Order of Mass and it will be the tiny start of slowly undoing a lot of damage and utter desacralization of the Mass. Simply “knowing” what the Mass “is” never will be enough to fix this. The liturgy ITSELF must make obvious what it “is”. Lex orandi, lex credendi. Reblogged this on Thoughts of a Hermetic sage . Sometimes it is hard to believe that the host is the actual body and blood of our Lord, Jesus Christ. And that Out Lord is actually present. Just like whe. I go to adoration, it’s hard to understand that Iur Lord is present just as the person next to me is. Please help me understand as I want to serve Our Lord , understand Him and love Him more.